Clarksville, TN – Earlier this year, Dr. Dwayne Estes, Austin Peay State University professor of botany, was eating lunch with Henry Paulson, the former U.S. Treasury Secretary under President George W. Bush, and his wife, Wendy Paulson, when the conversation suddenly turned to prairies. Between bites, Estes explained that for thousands of years, grasslands covered much of the southern United States, but today, more than 90 percent of this vast habitat, along with the different creatures that called these grasslands home, has disappeared. 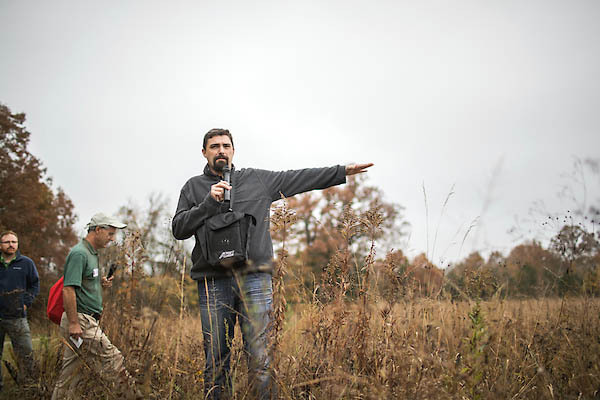 Austin Peay State University Professor of Biology, Dr. Dwayne Estes, leads a tour through Baker Prairie Natural Area.